~~Meets 2nd Thursday of the month, 7 pm at the Bellevue Regional Library, 1111 110th Ave Ne Bellevue. Networking begins at 6:30pm. No meetings in July, August or December. EGS is a WA Non-Profit Corp. They provide genealogical resources for the Bellevue Regional Library. A catalog of these resources is available on the King Co. Library website. They have a number of special interest groups; Computer, Czech/Slovic, Family Tree Maker, German, Irish/Scots, Italian, Legacy Family Tree and The Master Genealogist. Research services are available to those living outside of King Co. A fee is charged for non-members. Service area (East of Greater Seattle) includes; Bellevue, Woodinville, Bothell, Kirkland, Redmond, Newport Hills, Mercer Island, Renton, Issaquah, Carnation, Fall City, Duvall, Sammamish, Snoqualmie and North Bend. 1644 43rd Ave E, Seattle, 98112-3222 Phone: 206-328-2716. ​The library is located on Lake Washington, on the south side of Madison Park. It is in the lower level of the Washington Pioneer Hall. Use the stairwell on the north side of the building. The Seattle Metro Bus #11 comes right to the library, catch it at Pine & Westlake (downtown Seattle). Fiske Foundation, a Non-Profit, charges a fee for access to the Library, $5.00 daily or $50.00 annually (membership). The library catalog can be access from their website. ~~Hours: Mon – Sat, 10a – 4p. Closed Sun. Check website for education classes & on-going events. Library Management Team meets on the 3rd Wed, 1:30pm at the HQRL, meetings open. The HQRL is a WA Non-Profit Corp. The library contains over 15,000 volumes and microfiche. They provide a bookstore which provides all genre of genealogical resources. The bookstore sales help maintain the library and can be found at the library and at many genealogical events. The website includes an online catalog and other local resources. ~~Meets 2nd Monday of the month, Sept. – June. Check the website for location, it may vary. Doors open at 6:30p for networking, meeting begins at 7:15p. The JGSWS library of Jewish resources is located in the LDS Factoria Building, 4200 124th Ave SE, Bellevue, WA 98006 (in Factoria, just off I-90 and I-405). The catalog of their holdings can be accessed from their website. Special Projects: Indexing all of the Jewish Cemeteries located in Washington State; Indexing Vital Records (birth, bar/bat mitzvah, marriage, and death announcements that were printed in the Jewish Transcript and other Jewish newspapers during the past 80 years). ~~Meeting locations and dates vary, so check the website under Meetings. 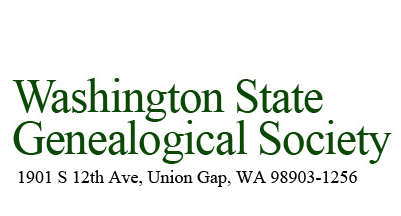 This organization is the local chapter of the Association of Professional Genealogists. The website offers membership applications and contacts with Professional Genealogists. ~~General membership meets quarterly. Meetings are open to the public. Check website for meeting schedule & location. ​Seattle G.S. is a WA Non-Profit Corp. ​ The Seattle Gen. Soc. Library is located at 6200 Sandpoint Way, Seattle, WA. Hours are: Tuesday-Saturday, 10am-3pm and Sunday 1pm-5pm. Their library contains 15,000 volumes and has online databases are (Ancestry.com, Fold 3 and American Ancestors) available for use on site. Research requests are available. Special collections include: George Kent Collection (focused on NJ and NY); King Co. Court Case Index, 1880-1890; Annie Pullien Obituary Collection from Seattle newspapers; King Co. VFW membership cards; 90% of 1890 census replacement; 1839 aerial maps of King Co; and a complete set of Seattle City Directories. Genealogical products and publications are available on site and online. Some databases are available online for members. Service area: the greater Seattle area and beyond. *Note of interest: located across the street from the NARA, Pacific NW Regional Archive. ~~Meets 3rd Sat. of month, 9:30am social, 10am-12pm program followed by business meeting (except July, Aug & Dec) at Wesley Homes Lea Hill, 32049 109th Place SE, Auburn, WA in 2nd floor Assembly Room. Meetings are open to the public. ​SKCGS is a WA Non-Profit Corp. They have a unique library system. The majority of their holdings were donated to the King Co. Library System and are available to the Auburn Branch at 1102 Auburn Way South, Auburn, WA. The remainder of their holdings are in a circulating library, which is available at monthly meetings. A link to the circulating library catalog on the website for ordering books. Special Collections include: Memorial Records of So. King Co., Black Diamond Cemetery Records, King Co. and Kent area Marriages, King Co. and Kent area Obituaries from early newspapers, Obituaries from the Renton Record/Chronicle Newspaper 1927-1932, South King Co. Obituaries 1991-2007. The SKCGS website includes searchable online databases. Service area includes: Algona, Auburn, Black Diamond, Burien, Covington, Des Moines, Enumclaw, Federal Way, Kent, Maple Valley, Normandy Park, Pacific, Ravendale, Renton, SeaTac and Tukwila. ​~~Meets annually, 2nd Sat. in March at the Swedish Club, 1920 Dexter Ave. North, Seattle, WA. Meetings are open to members and invited guests. ​The Swedish Finn Historical Society is a WA Non-Profit Corp., associated with the Swedish Club. They maintain a genealogical resource library and provide research services. Hours are: Mondays, 9am-12:30pm; Wednesdays, 2pm-5pm; Thursdays, 9am-12:30pm and the 1st Sunday of the month, 10am-2pm. Online databases are available on the website for members. Special Collections include; DEE Database (Document Every Emigrant) with over 38,000 entries, digitalized "Leading Star" newspapers, Order of Runeberg Lodge records, 14,000 Obits of Swedish Finn immigrants, Emmaus Lutheran Church records and a photo database with names. ~~Meets 2nd Tuesday of the month, (except July & Aug.) 6:30 pm, at Bates Technical College, South Campus, 2201 South 78th St, Building E, Tacoma. Parking available in Lot 11. Special Collections include; Online Index to Pierce County Records published in the “Researcher” from 1969-2013, which includes records from; Bibles, Cemeteries, Census, Churches, Courts, Funeral Homes, Land, Military, Naturalizations, Probate Abstracts, Schools, Taxes, Vital Records, Voter Registration, WA Pioneers and other misc. records. The website provides indexes of cemeteries; Pierce Co. schools and Veterans Graves in Pierce Co. The Society offers look up’s from their indexes, research services and copies of obituaries for a fee. A list of published local genealogical resources is available for sale on the website. A Genealogical Collection of Resources and Obituaries are available in the Northwest Room of the Tacoma Public Library. Service area includes; Tacoma, Ruston, University Place, Lakewood, DuPont, Roy, Parkland, Spanaway, Elk Plain, Sumner, Prairie Ridge, Carbonado, Buckley, LaGrande, New Reliance, Elbe, Ashford, Ohop, Kapowsin, Graham, South Hill, Puyallup, Bonney Lake, Orting and Fairfax.